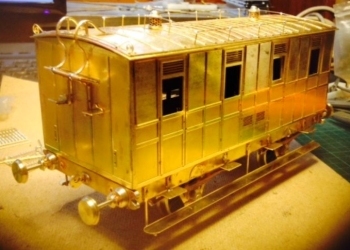 This is a lasercut kit of a historical railway carriage of the mid 1800's, designed and produced in-house by Diagram3D. The kit is based on information gathered about a grounded coach body by the LNWR society. This kit is also available in 7mm scale. The kit is manufactured in MDF and card with clear acrylic glazing. The kit is supplied with printed instructions. The construction takes advantage of the strength of MDF combined with the detail of the card components to give a sturdy result. The model has a detachable roof. Download the assembly instructions for further information. A fine Gauge 3 model is available from Williams Models who were actively involved in documenting the prototype..